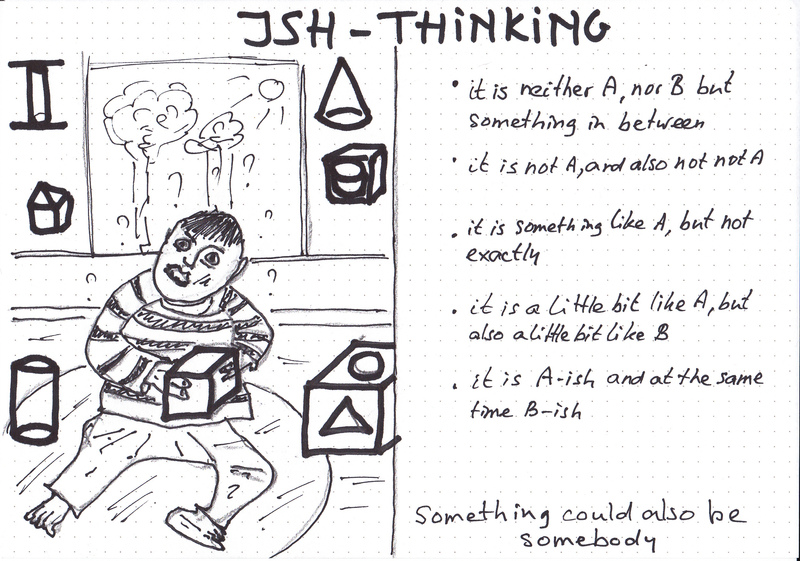 As an introduction to a series of blogposts about conceptual thinking we will start by paying attention to “ISH-Thinking”. 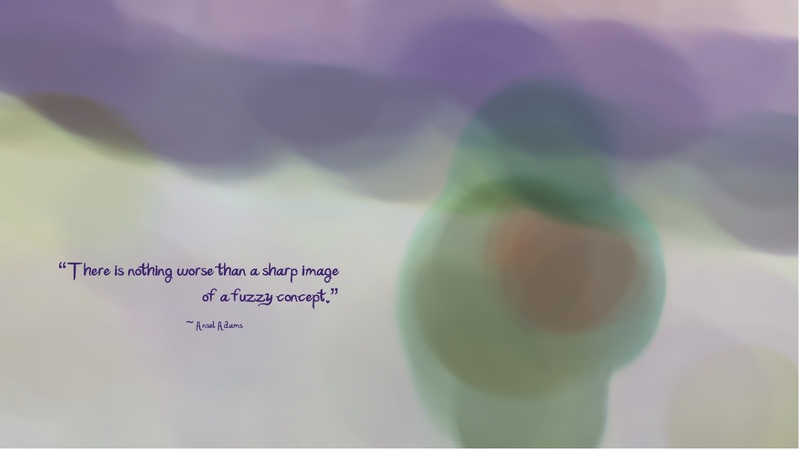 A concept is an abstract pattern in the brain that stands for some regular, recurrent aspect of the world, and to which any number of different words can be attached. Sometimes ago we already pointed out the relation between thinking and language, as in our posts How Thinking Patterns are Created, Banging the World into Sorting Boxes and Key Concepts as Optical Filters. As we see in the picture below a toddler is confronted with a an almost insoluble problem. He has to place a square block in a box, which, however, only has openings in the form of a circle and a triangle. Perhaps the toddler might solve the problem by redefining the block as two pyramids stuck together. The block is “pyramid-ish” and might fit the triangle opening. In our daily lives, we often try to give meaning to a diffuse situation by drafting a metaphor that is more or less “like-ish”. Mostly the metaphor does not fit exactly, at least not literally. Mostly we don’t have any problem at all in using these ill-defined concepts. It helps us to articulate confusing and in particular emotional situations to “get grip on them”. Less prevalent is “ish-thinking” to describe seemingly well-defined physical objects. You will rarely hear someone who discusses a concrete thing (a bridge, a museum, a coffee shop) as ” thing-ish” like bridge-ish, museum-ish, coffee shop-ish). Yet, Starbuck is coffee shop-ish. Also, a kind of museum which would work like a modern library could be called museum-ish or library-ish: Art-works will be transported from the basement to the museum room at the request of the museum visitor, like in libraries with books. 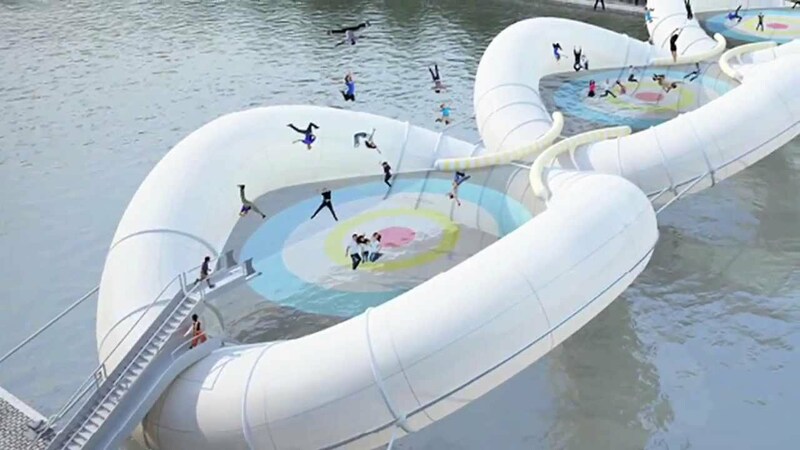 In this instance it’s about inviting people to cross a body of water in an unconventional manner… by using an inflatable bridge equipped with giant trampolines. Is it a bridge or is it a gigantic trampoline? Or both, or more or less?